Dr. Leigh Erin Connealy has sounded the alarm: Cancer is a pandemic. Now, in The Cancer Revolution, Dr. Connealy shares her groundbreaking integrative approach to both treating and preventing cancer. 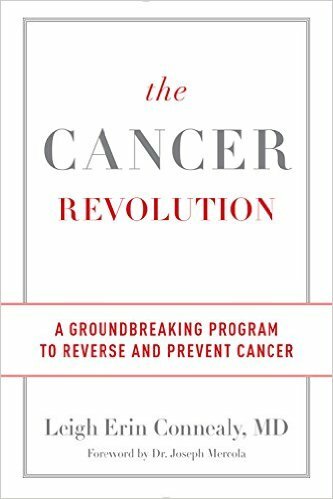 “Fortunately, you can learn about many cutting-edge cancer therapies by reading this book,” says Dr. Joseph Mercola in The Cancer Revolution foreword. “Dr. Connealy carefully and clearly details the wide array of comprehensive strategies that you can consider for treating cancer. There really are an astounding number of choices and she does a magnificent job of compiling them conveniently in one place. It would take you many weeks, and more likely months or years, to collect the options that she concisely reviews here. Remove toxins to repair and restore your body. Harness the healing power of supplements. Get moving to get well. Reduce stress and reclaim your life. Strengthen your immune system with sleep. With a 7-day detox and a 14-day healing program — including recipes based on anti-cancer foods, as well as inspiring stories from patients successfully treated at the Cancer Center For Healing — Dr. Connealy provides the tools to prevent and treat cancer, and hope for patients and those at risk that they can live cancer-free. Another reason the mainstream approach is inadequate is neither chemotherapy nor radiation nor surgery can eliminate what are called circulating tumor cells (CTCs) or cancer stem cells (CSCs). These are cells that break off from the original tumor and float around in the bloodstream (a process called metastasis), looking for their next “nest.” CTCs and CSCs are responsible for more than 95 percent of all metastases and cancer deaths, but scientists haven’t figured out a perfect, surefire way to eradicate them, so conventional treatments fall short on this crucial front. Further, these treatments don’t address any of the cancer’s survival mechanisms or the body’s functional imbalances. Cancer is caused by the deregulation of multiple genes, which must be individually targeted by different natural anticancer agents. Did you know that what you eat and drink could be the single most important determinant of whether you develop cancer or beat it? The right foods are medicine for your body and contain all of the vital nutrients that you need to improve and function properly. We all want energy, and you need energy to fight cancer, but to get it, you need to have the proper types and proportions of protein, carbohydrates, and fatty foods in your diet, and to choose the sources of these macronutrients wisely and thoughtfully; otherwise, the machinery of your body won’t run well. Don’t be shy about asking for help — you might be surprised to find that some people will consider it an honor and a privilege to participate in your recovery. For instance, we have found that some of our patients’ co-workers will give up their sick leave or vacation days for them. It may be hard for you to ask for help because perhaps you were raised to believe that you’re just supposed to “pull yourself up by your own bootstraps.” Or maybe deep down, you just don’t believe that you are worth it. … Regardless, we aren’t meant to get by in life on our own, so if this is you, I encourage you to reach out to others despite your discomfort because you deserve to get well, and when you are well, you can more effectively help other people. “The Cancer Revolution enables everyone to understand and take responsibility for their health and their role in the prevention of disease. It is truly an outstanding guide of how to create health and maintain wellness — from a personal and professional standpoint,” notes Paul Fisher of Biotics Research. Discover the latest in cancer prevention and treatments. A breakthrough plan for healing! and hope for patients and those at risk that they can live cancer-free. A list of recommended books that cover alternative cancer treatments.